I’m writing in Rochester, New York. I’m in a suite overlooking the reassuringly golden brown Genesee River. I see the pretty University of Rochester campus from my window, greening with every ring of the cathedral bell. I’ve gathered all my Moleskines, every last one of them, because you never know, and I have piled a hefty amount of my favorite female writers for inspiration: MFK Fisher, Virginia Zaharieva, Joan Rivers, and Kim Gordon (born right here in Rochester, it turns out). For three weeks, I am writing, reading, and translating. I’m here for my literary translators’ residency thanks to the Elizabeth Kostova Foundation and Open Letter Books. My hosts here are the unstoppable Chad Post, who runs Open Letter, and the lovely Kaija Straumanis, Latvian translator and editorial director of the press. The book I’m working on, The Same Night Awaits Us All: Diary of Novel, by the inimitable Hristo Karastoyanov has just been shortlisted for another major award in Bulgaria. I’ve been locked in for days. I blink and an hour has gone by. When I write, time disappears. I attend classes, endeared by the young literary enthusiasts who aptly discuss books in translation, and writing, and say things like, “after I graduate, I’ll take the summer off to figure out my life.” It takes a little longer than that, I smile. And they are reading, all the time. One day, they workshop an excerpt of mine and all of a sudden my ego gets taken down a notch or two. Iterations. Why is translation so heartbreaking? For one, the Bulgarian is old, a bit tortured, and it’s complex. A verb can be conjugated in such a way as to portray an inferential tense—an alleged happening, not yet completed, which has occurred in the past, in which the teller, who hasn’t witnessed the not yet finished event, is retelling it. And of course this meaning is contained within a single conjugation. The book I’m working on is a fictionalized account of a very dark and tumultuous time in 1920s Bulgaria. The main characters, Geo Milev and Georgi Sheytanov, prodigious poet and most wanted anarchist, respectively, are as real as it gets and Karastoyanov uses meticulous research to bring them back to life. (And then kill them again.) But, naturally, he wasn’t there to hear them chatting, which is why the book is written entirely in the inferential mood. It’s an incredibly crucial nuance that in the English version I have no choice but to deem true. We’ll just assumed it all happened, OK? We must not only strive to retain the meaning, we must oblige the melody, Nabokov says. In Bulgarian, there’s a band of single syllable expressions that, when strung together, can accelerate into massively potent, utterly untranslatable exclamatory phrases. “A, kak li puk ne!” has a slightly malicious, confrontational undertone which is a thousand years in the making and no “Yeah, right!” can possibly do it justice. The Russians give their aristocrats French phrases, which translators are quite happy to italicize. The reader is simply expected to speak passable French. But in Bulgarian, many less words are in French than they are in Turkish, nodding not to some aristocratic vein, but bowing their heads instead to five hundred years of spiritual oppression and slavery by the Ottoman Empire. Poturchen, for instance, literally means “enturked” or to have have been forced to give up Christianity in the name of Mohammed. Figuratively, it means to be lost, never to be found again. How do you translate that? Then we have the thousands-deep spectrum of Bulgarian diminutives for which there are no single word counterparts (more heartbreak), and the imbuing of the inanimate with masculinity or femininity. In Bulgarian, Death is female (how surprising), but in English it is, of course, neither. But when Karastoyanov writes that following the evisceration of the poet’s right eye and the loss of part of his skull from the blast of a British shrapnel in WWI, Death “. . . had held him in her embrace for seven days and seven nights . . .”, I have to keep Death female. How long does it take to translate, I often get asked. Millennia, I want to answer, especially when just one of Karastoyanov’s trademark, nine-line sentences can—and does—take an hour. I don’t have millennia, however, I have three weeks to find my voice within Karastoyanov’s. When I do leave my hotel room for air, I am treated to incredible experiences. 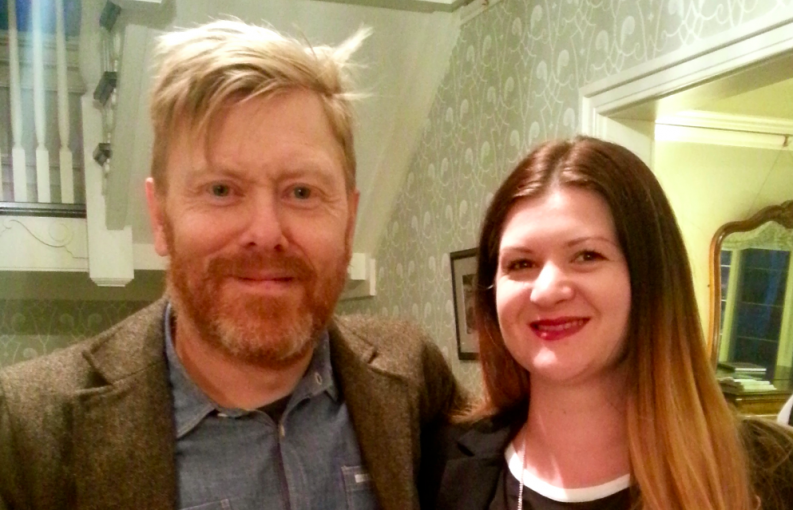 Just the other night I had the pleasure of two evenings with Jon Gnarr—writer, guerrilla politician, stand up comic, actor—who stopped by Rochester as part of his book tour promoting The Indian, the excellent first installment of his memoir trilogy, which has been translated from Icelandic by Lytton Smith. Gnarr has just finished a residency of his own in Texas and now sports a black tattoo of the state’s unmistakable shape on his upper arm. Nine of us—writers, translators, humans—have dinner. We drink wine, share plates of braised beef with couscous and chicken tika masala and prosciutto-wrapped artichoke hearts and ask Jon about his experiences in what is quite possibly the most guerrilla political achievement I have certainly ever heard of. Following the global financial crisis in 2008, he formed a mock political party, ran a satirical campaign, then got himself elected, as he puts it, “to the horror of all, including myself” as mayor of Reykjavik, Iceland’s capital and largest city. He might have even saved it from economic collapse. Now there is talk—an urging, rather—for Gnarr to run for president. He might, or he might not. But consider that this man was, in childhood, repeatedly told he was intellectually stunted, afflicted with dyslexia so severe it rendered him unable to write even his own name, let alone several books, some of which have now been translated into multiple languages. Limitations? All in your head. He was talking about just a single line of Pushkin’s.